Sutton Boxing Academy launched the opening of their new boxing centre on Friday 9th March, with an excellent demonstration by some of the children attending the Duke of Edinburgh Award scheme run by St Helens College Launch Pad initiative. Brian London ex professional boxing legend who in 1966 fought Mohammed Ali was also there to support our team of dedicated staff. 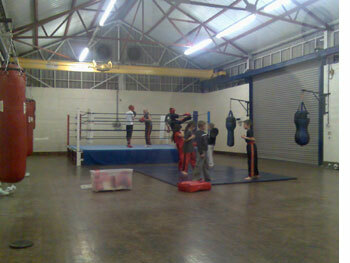 The newly launched Boxing Centre provides without doubt one of the best facilities in the region. Boxing offers one of the best fitness regime for mind and body. The approach of the Owner, himself one of the UK best heavyweight boxers during the 90's, is a balanced method combining diet and boxing circuit training resulting in improved stamina, fitness levels, concentration and discipline. "Kids on the street, hanging around with nothing to do have seen the challenge that boxing provides, the recent success' of young people like Amir Khan and the olympics coming to the UK in 2012 is inspiring young people in the Borough to take part in our boxing schemes and the benefits are plain to see"
Anyone can take part in our frequent boxing circuits and each person can find their own level and be encouraged to achieve sustainable improvements to their fitness, discipline and concentration. If your simply curious about taking part or you think you have potential to be a serious contender feel free to drop in and talk to one of our coaches. 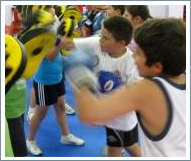 For further information about boxing circuit times please click here. For information about private boxing tuition with one of our coaches and prices click here, for any further information about our boxing facility please click here and complete out contact form.